Leaves 2, linear, 15–25 cm long, 3–4 mm wide, conduplicate. Raceme 20–35 cm high, 3–5-flowered. Flowers orange, heavily blotched and suffused with brown and purple. Dorsal sepal ovate, 6–10 mm long, 7–10 mm wide, erect. Lateral sepals linear to oblanceolate, 12–18 mm long, 2–4 mm wide, crossed and recurved beneath the labellum. Petals divergent; lamina ovate to obovate, 5–11 mm long, 4–9 mm wide; claw 5–9 mm long. 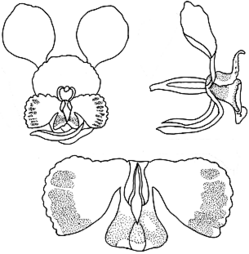 Labellum 4–8 mm long; lateral lobes narrow- to broad-cuneate, 5–8 mm long, 2–7.5 mm wide, margins crenulate; midlobe cuneate, 5–7 mm wide, ridged along midline; callus of 2 raised ridges 3–6 mm long. Distribution and occurrence: Grows among grass and shrubs in sclerophyll forest; south from Nerriga ST; ?Vic.